Powers/Abilities: Incredible hypnotist, able to instantly put someone under with a glance. He generally uses this to make people see things that are unreal - e.g. create magical illusions. In the earliest stories Mandrake was a genuine magician, with real supernatural powers, but as time passed he was returned to just being a skilled human employing trickery. 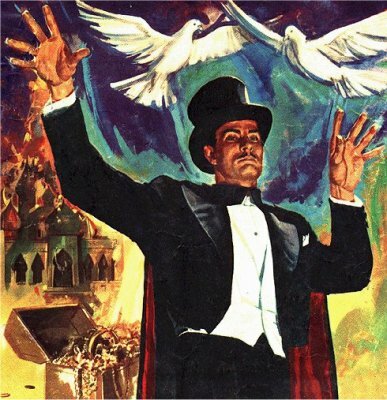 The Defenders of the Earth cartoon returned him to being a proper magician. History: Mandrake learned his superhuman abilities during years of schooling in Tibet when he was but a youth. 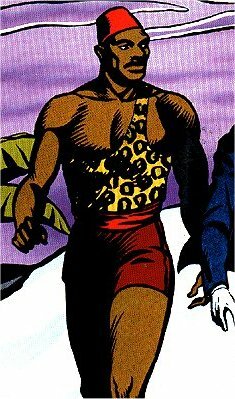 Along with his friend and ally Lothar, an African prince who chooses to pose as his valet and bodyguard, he uses his powers to battle crime. Among the more notable foes have been Cobra, who used to be one of his teachers in Tibet under his real name of Luciphor, and an evil brother Derek. Mandrake. Comments: Created by Lee Falk when he was 19, in 1924 (although the character wasn't published until ten years later. Narda, Mandrake's beloved, is a member of the royal family of the tiny European kingdom of Cockaigne. He finally married her in 1998, after several decades of courtship. Mandrake appeared on the big screen in 1939 when a twelve part serial starring Warren Hull as Mandrake was made by Columbia. He also starred in a radio series, which aired on the Mutual radio network between 11th November 1940 and 6th February 1942 - this began as a three day a week serial and became five days a week from 1941. Mandrake was portrayed by Edward Johnson. It was Anthony Herrera's turn to portray him in a 1979 movie, and when Mandrake turned up in the Defenders of the Earth cartoon, Peter Renaday played the part. Larry Lowery has an interesting site which covers the Mandrake "Big Little Book" and discusses his radio show. You can also read about other Big Little Books there, and hear the introduction to the original Mandrake radio show. Moonstone Publishing have announced plans for a new Mandrake comic. Powers/Abilities: Lothar is exceptionally strong. In the cartoon Defenders of the Earth, the version of Lothar there is superhumanly strong. History: Lothar is an African prince who befriended Mandrake the Magician when the latter was visiting Africa. Lothar was the "Prince of the Seven nations", heir to the throne of a federation of jungle tribes. Lothar and Mandrake's friendship proved so strong that Lothar decided to give up his claim to the kingship and lend his assistance in Mandrake's crimefighting ventures, posing as his friend's valet. It took Lothar a few years to perfect his English (until around 1965 in fact) and adapt to the western world, but now he is his friend's right hand man, and vice versa. Comments: In the 1939 Columbia serial of Mandrake, Lothar was played by Al Kikume. Juano Hernandez portrayed him next, in the 1940-42 Mandrake radio serial. Ji-Tu Cumbuka was in the role for the 1979 movie version. In the Defenders of the Earth cartoon, he was voiced by Buster Jones. That cartoon moved him up from being Mandrake's sidekick to being a hero in his own right, and introduced his son L.J.